The concept of sharing storage space emerged in the early 80s with the development of file sharing protocols. As the market progressed, the next logical step was the emergence of a stand-alone Network Attached Server Software, which could be run on the hardware of user’s choice. And therein enters an array of NAS software. Don't get confused by the similar-sounding names: FreeNAS vs NAS4Free. They both share the root code, but are different products. The foundational project started in 2005, but in 2009 the development team started to shift away from ZFS and towards plugin architecture. 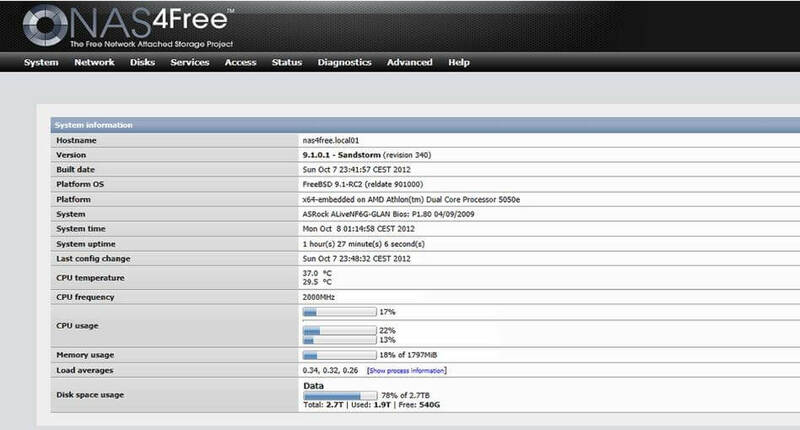 This divergence culminated in FreeNAS being acquired by ixSystems (the makers of FreeBSD), and the original codebase continuing under the banner of NAS4Free. Now let’s go through the features. In hard drive and storage management, NAS4Free provides full ZFS support (File System and Volume Management knit into one package). To counter the redundancy problem, it supports RAID 0, 1 and 5 (and all their combinations). For data security, it supports disk encryption using the host CPU, as well as Cryptographic Accelerator card. List of file systems supported by NAS4Free include Sun Microsystems' ZFS, Unix File System (UFS), Extended File System (Ext 2 and Ext 3), File Allocation Table (FAT) and Microsoft's NTFS. It supports both partitioning schemes for hard drives: the old Master boot record (MBR), as well as the newer, standard GUID Partition Table (GPT). Network Protocols signify the different ways through which data can be moved around in networks. Different system manufacturers have different protocols; NAS4Free supports all the major ones: SMB/CIFS, AFP, NFS, FTP, RSYNC, Unison, SCP and iSCSI. What more, it comes with advanced features like vlan tagging, wireless connection, link aggregation, CARP (Common Address Redundancy Protocol), HAST (Highly Available Storage) and Bridge. Taken together, these features increase the speed, efficiency and reliability of the data moving from node to node. As a bonus you will also get many pre-installed services like Transmission (a strong BitTorrent client), Lighttpd (famous webserver), Firefly (DAAP server for media files), FUPPES (Universal Plug and Play server for auto-detection of network devices) and IPERF3 (a bandwidth measurement tool). NAS4Free hardware requirements are minimal as the OS is lightweight. The software can be installed in two ways: embedded installation and full installation. In embedded installation, essentially NAS4Free USB install or on a SSD drive or Compact Flash Card (CF card). This leaves up all your available hard drives open for storage. It is a light and energy efficient way, and it makes the process of updating much easier (in which you can simply download NAS4Free in .img.xz format using GUI interface from your browser). In comparison, full Installation takes up the valuable hard drive space (although only few hundred MBs), as well as the SATA port. Upgrades in full installation will require you to boot from CD/USB again, and it cannot be done over Web GUI. And yes, NAS4Free can be booted from LiveCD or LiveUSB as well. Access to NAS4Free is through great looking web interface. The default username is admin and the NAS4Free default password is nas4free. In conclusion, NAS4Free supports sharing across multiple operating systems, including Apple, Windows and other UNIX-like systems. Its website features detailed documentation (a technical wiki) as well as user forums where users will find the tech support they are looking for. Lastly, do keep the update feature in mind, because NAS4Free rolls out regular updates to its software that include version upgrades, security and stability tweaks, bug fixes and new features. All of the controls and configurations are accessed through an easy-to-use WebUI.